Ottavio Leoni (1578 - 1630) was an Italian painter and printmaker of the early-Baroque, active mainly in Rome. He was born in Rome, where he first trained with his father, Lodovico Leoni. He painted altarpieces for churches in Rome such as an Annunciation for Sant'Eustachio and a Virgin and child with St. Giacinto for Santa Maria della Minerva, and a Saints Charles, Francis, & Nicholas for Sante Urbano. He became a member, and later president, of the Accademia di San Luca and a Cavalieri of the Order of Christ, on which occasion he presented the church of the Academy the Martyrdom of St. Martina. He died in Rome. Ottavio Leoni was also the engraver of a set of portraits of painters. His portrait of Michelangelo Merisi Caravaggio is the only documented portrait of the painter by another artist. His work is exhibited in places such as Fine Arts Museums of San Francisco; Museum of Fine Arts, Boston; National Gallery of Art; Bowes Museum; Courtauld Institute of Art; Los Angeles County Museum of Art; and Palazzo Ruspoli, Rome, Italy. Danish, 1854-1933 Laurits Andersen Ring (1854-1933) was one of the foremost painters of Danish symbolism. He was born as Laurits Andersen in the village Ring in southern Zealand. In 1881 he the took the name of his birth place, and was since known as L.A. Ring. 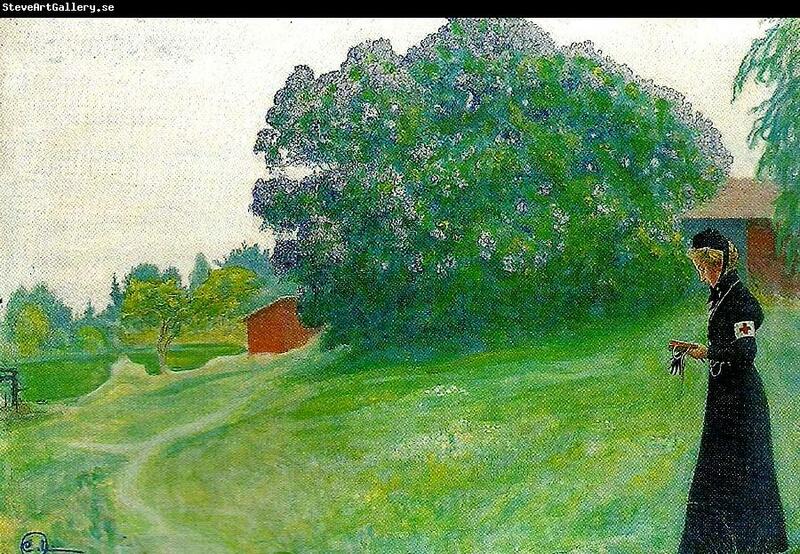 For a while, he lived at Baldersbronde near Hedehusene in the old school building, which was later to be the home of another painter, Ludvig Find. Ring has produced several paintings from these towns. As a painter, he never distanced himself from his humble origin, but rather made it his dominant theme. Most of his paintings depict the village life and landscapes of southern Zealand from Præsto to Nestved. There are several examples of his work at practically every Danish art museum including the Hirschsprung Collection in Copenhagen. He was married on July 25, 1896 to fellow painter Sigrid Kahler, who was the daughter of ceramic artist Herman Kahler.